Background Only a few decades ago, the common recommendation given to patients with rheumatoid arthritis (RA) was to rest. Nowadays, physical activity and other means to improve well-being and functioning are encouraged, and pharmacological treatment has improved tremendously. Objectives To examine if well-being and functioning in RA patients improved over the past two decades, and whether this is explained by a reduction of diseased activity. Methods From 1990 to 2011, consecutive annual cohorts of RA patients (N = 1151, age 17-86 years, 68% female, 62% rheumatoid factor positive) were monitored. Functional status, mood, and anxiety were assessed at diagnosis (baseline) and after 3 to 5 years of treatment (follow-up), and were subsequently predicted by year of assessment and disease activity (erythrocyte sedimentation rate, joint score) in hierarchical multiple regression analyses, controlled for age, gender, education level, marital status, and RF. Cohen’s d expressed effect size. Results At baseline, small improvements in depressed mood (d = -0.36, p =.01), anxiety (d = -0.46, p =.001), and functioning (d = 0.32, p =.02) were observed. At follow-up, level of depressed mood and (baseline-adjusted) levels of cheerful mood and anxiety showed small improvements over the two decades (0.24 ≤ d ≤ 0.43, p ≤.04). A medium (baseline-adjusted) improvement in follow-up physical functioning was observed (0.72 ≤ d ≤ 0.79, p <.001). Taking decline in disease activity into account, trends in baseline functioning and follow-up well-being were no longer significant (p ≥.07) while upward trends in baseline well-being (p ≤.03) and follow-up functioning still were (p ≤.01; see Figure 1). Small effects on results were observed of variables that changed across the years such as an increase in education level and the number of males. 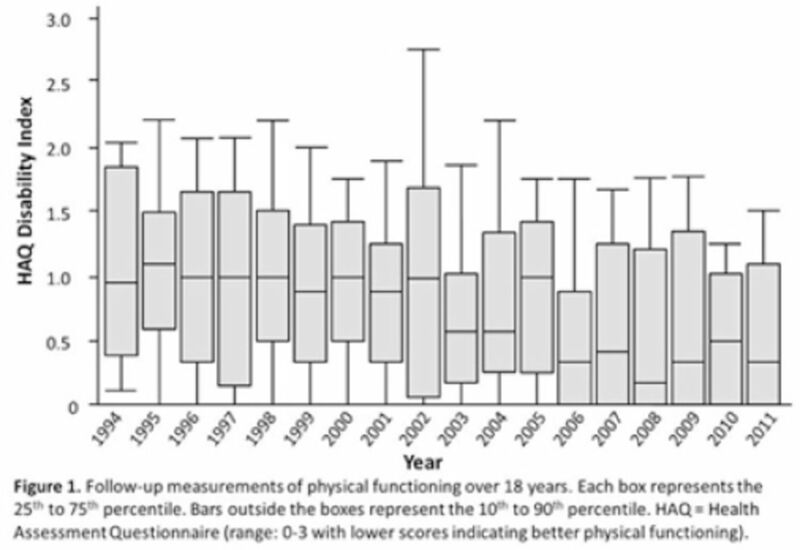 Conclusions Over the past two decades, well-being and especially physical functioning have improved significantly. These trends are partly explained by a decline in disease activity. The results support the impression that improved pharmacological and educational interventions have contributed to an improved quality of life in RA.